As the warm spring afternoons and hot summer nights converge upon us, so too do cravings for finger foods and barbecue. The foods we serve at these warm-weather celebrations should be refreshing, but also easy to handle. And there are no easier foods to handle in many cases than an appetizer-on-a-stick. These seven skewer recipes are among the best appetizers-on-a-stick that you’ll find anywhere. Antipasto means before the meal in Italian. Much of the time, people expect antipasto to be served on gorgeous platters, alongside a plethora of cheeses and fermented vegetables. But putting the meats, cheeses, and veggies on a skewer means that your guests can mingle while they eat – a win-win for everyone. 1) Make a simple antipasto on a stick by assembling sliced meats, like pepperoni, ham, and salami. 2) Next, slice up some Italian cheeses, like Mozzarella, Fontina, Provolone, and Taleggio. 3) Finally, gather up some olives, artichokes, and pepperoncinis. 4) Place them on your skewers, alternating meats, cheeses, and vegetables, and serve. Your summer garden counts as one of the best resources for delicious appetizers served on sticks. Think plump cherry tomatoes, abundant zucchini, sweet red onions, succulent asparagus, bell peppers, the works. To prepare this skewer of summer sun, wash and cut up the vegetables that you want to have on the skewer. Once you have added the veggies to the skewer, brush them lightly with a garlic butter or olive oil. Place on the grill until the veggies are roasted. This peach, basil, and tomato skewer tastes sweet and tangy and offers you a food-on-a-stick recipe that’s on the lighter side. 1) Skewer some cherry tomatoes, along with some sliced peaches, basil leaves, and mozzarella balls. 2) Drizzle a gourmet oil onto the skewers, like a jalapeño or basil oil, which you can make or find in specialty cooking shops. 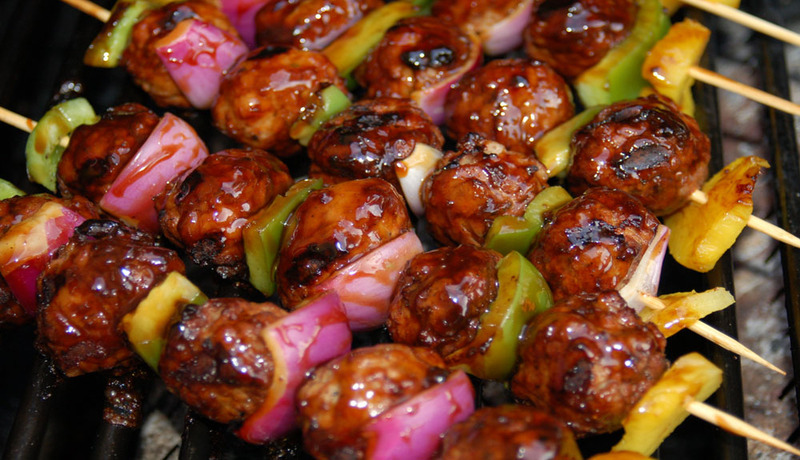 Meatball Skewers is an easy food-on-a-stick to make. It’s also okay to cheat on this recipe if you want start with some ready-made meatballs. 1) Get the meatballs of your choice. Put them into the slow cooker. Add ingredients, like barbecue sauce or ketchup, jam or jelly, and soy sauce. Allow them to cook until the meatballs are done. *Substitute vegetarian meatballs to serve this recipe to your vegetarian friends and family members. Spuds-N Cheese is a fun party appetizer and provides you with a taste of comfort food in each bite. 1) Start by putting your favorite tater tots in the oven and baking them until done. 2) Gather up your favorite cheeses, like cheddar or Monterrey Jack and cut the cheese into cubes. 3) Once the tots are done, slide them onto a skewer, along with the cheese and some dill pickle slices for some extra tang. 4) Serve with ketchup or ranch dressing. *You can also bake alternative tots (made from broccoli, cauliflower, and other veggies) and skewer them like you would the original recipe. Or mix the tot flavors on your skewers for something really fun. 2) Slice up a red onion, along with some peppers of your choice to complete the preparations for the grilled salmon skewers. 3) Layer the ingredients on the sticks, alternating the peppers, onions, and salmon. 4) Treat the skewer with a brushing of olive oil that you’ve mixed with lemon juice, sea salt, and black pepper. White pepper adds an unexpected kick to this recipe, but is optional. Grill these appetizers until the salmon is done and the veggies are roasted. Pretzel and Ham sticks should be a go-to recipe for your home movie nights. Fortunately, it happens to be as easy as it is delicious. 1) Bake the soft pretzels. Store-bought pretzels are fine. 2) While you wait for the pretzels to bake, slice up some cured ham. 3) Once the pretzels are done, cut up them up into small pieces. Layer your skewer with pretzel pieces and ham until the skewer is full. Garnish with the mustard of your choice. 4) Add some flavor to these appetizers by making some cheese cubes to layer in with the pretzels and ham. Try different flavors of mustard, like honey or spicy to make the taste of this appetizer all the more appealing. *Make this appetizer vegetarian but substituting the meats and cheeses for vegetarian deli meat and cheese alternatives. Appetizers on sticks provide a delicious and fun way to serve up some of your favorite flavors together. Remember, the best party-planning should include a variety of appetizers to appeal to a variety of tastes and dietary restrictions. The appetizers on this list will appeal to vegans, vegetarian, and even keto eaters. Try one or all of them at your next party. It’s unlikely that you will have any leftovers, but a lot of happy guests.